The evolutionary-ecological drivers that have generated the behavioral diversity in chimpanzee populations are still largely unknown. Progress towards a better understanding of these diversification processes is currently constrained by the small number of field sites at which chimpanzees are studied. Potential explanatory variables, related to resource availability, historic landscape effects, predation and disease pressure or population inherent dynamics influencing trait invention and loss, by far exceed the number of chimpanzee communities studied. The Pan African Programme (PanAf) ‘The Cultured Chimpanzee’ aims to overcome some of these limitations by studying a large number of populations with a cross-sectional sampling approach. It will quantify a broad spectrum of the ecological parameters that possibly contribute to generating behavioural diversity in chimpanzees and will thus also evaluate potential evolutionary scenarios to decipher central questions of human cultural evolution. For this we collect systematic ecological, social, demographic and behavioral data on 35 to 40 chimpanzee populations spread out over their whole natural range (Figure 1). 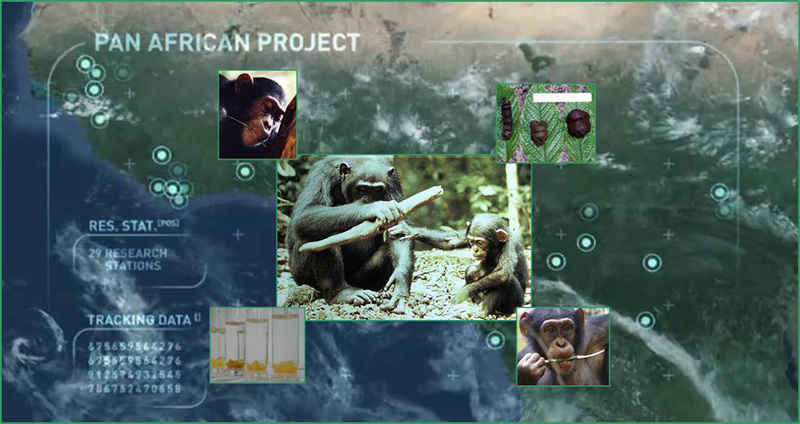 To date, we have established 34 temporary (one-year) research sites (TRS) across the chimpanzee range, including all extremes of their habitats, and placed systematically across their area of occurrence, to be able to tease apart the genetic, ecological and social drivers of diversity generating processes. Most of the TRSs focus on populations which have never been studied in detail, however, some are also located at well-established long-term research sites.